There are some people who actually prefer to work alone. There is a most interesting article on trade-schools.net, which has a large number of jobs listed for the loners and introverts of this world. If you read this article you will see that the job of data scientist is NOT listed. The rest of this article will explore why it is true that data scientists need to work in groups. Extroverts are happiest when they are with other people. Obvious examples of occupations, where extroversion is an important benefit are politics, teaching, and sales. Introverts are the opposite of extroverts and prefer being alone or with only small groups of people. Any attempt to pigeonhole data scientists into either extroverts or introverts will fail. 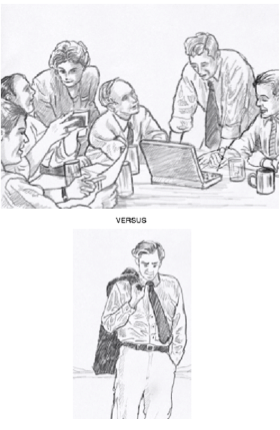 Data scientists include people in both groups. A very good post produced by the SAS organization explores this. Before the end of this article, I will be talking about the actual tasks performed by data scientists. As a neophyte in the field, even with a degree from a good university, you will need help to get started in your first job. Working professionally in data science is different from taking part in a data science competition or doing projects at your university or other learning institution. Here are some examples. What you do has to be aligned with your organization's practices. You will need guidance to make sure it reaches that harmony. You'll find that most genuine data science is performed in teams. You will need guidance to help you merged with that team. Much of what you do will have to be robust. Someone has to show you what your works output has to be robust against. A recent piece in the Data Science Weekly site lists 30 different tools including statistical packages, computing languages and networking tools that are in demand in the data science field. The data science field is vast, but fortunately, in order to get a job, it suffices to know only a few of these many tools. A good suggestion would be to master one or two and to have a passing knowledge of some of the others. The article recommends learning R, SQL, and Hadoop. It also recommends some other tools that a passing knowledge of would be useful. In view of a large number of tools needed, the necessity for a group of people working together in unison, with members having different expertise is obvious. One of these is visualization. It is critical to data science. Visualization entails unearthing important information hidden in large datasets and transforming it into a form from which future action can come. This form could be a bar-graph, spread-sheets, a heat map or something else. This activity is very computer oriented. Modeling is an important skill in data science is modeling. This is not the kind of modeling seen on catwalks but mathematical modeling, involving such things as linear algebra, Bayesian statistics, Markov chains, etc. An important part of data science is data engineering. The responsibility of data engineers is ensuring that the data required by the visualizers is in a form that can be used. As well as these duties, other members of data science teams may have to interface with customers and clients. Sometimes a project is so large that a number of data scientists will have to work on the project. They must be able to collaborate. The person leading the project will have to understand it and how all members of the teamwork on it. If you are a member of a data science group or team then it is very useful to see how a well-functioning data science team works. One organization that knows the importance of data science is Twitch, which is Amazon's video streaming department. There are numerous sources describing this success. With any search engine, enter data science twitch. You will get many hits about a group of data scientists working at the cutting edge of technology. Another huge company, which has become very reliant on its group of data scientists, is the Ford Motor Company. Its team has the glamorous name of Ford Motor Company Global Data Insights and Analytics unit [GDIA]. The company used data analysis for decades before 2015 but did so in an ad hoc manner, until 2015, when GDIA was formed at the beginning of that year with a staff of one. There are now more than 600 members of Ford's GDIA unit. It is not only big companies that have teams of data scientists. Carvana is a Phoenix, Arizona, online car dealer. It only has a staff of fifty, five of whom are data scientists. These five have greatly helped Carvana in its pricing and financing. The use of data scientists is beneficial to small as well as large companies. Some human beings prefer to work alone but most prefer some interaction with other people. Irrespective of their wishes in this respect, data scientists have to collaborate closely with their peers and interface with non-data scientists. Data scientists usually require experienced members of the profession to help them into their positions. There are many skills required in data science. Data scientists are unlikely to master more than a few of these skills. In order for an organization to get the best out of its data scientists, it needs to assemble groups of them that work in harmony and have complementary skills. Bio: Norman Arvidsson is an experienced freelance writer and marketing expert. He currently works as a blog editor at EssayPro. His interests include technology, business writing, and web design. You can reach him on Twitter.